As an adult (I write down a grocery list now, so I am one), there are milestones you assume you’re going to accomplish. When you don’t, it can effect your emotional and mental health greatly. Feelings of inadequacy can take over your psyche and have you believing you are not enough. That your actions are meaningless and that all of your endeavors are useless. Allow myself to feel whatever it is I am feeling at the time. Often we are told to immediately let go of a negative emotion and release it into the universe. Giving yourself permission to feel the emotion and not suppress it. Change your thought patterns. I have to make myself choose to celebrate the positives instead of wallowing in the negatives. Also, understanding that in reality those negatives are not as grand as I am making them out to be. Meditate. I know I write about this often but it truly does make a huge difference. I listen to meditative music/binaural beats every night before bed, which has made a positive change on my emotional and mental state. Talk about how you feel. There is a difference between venting and dumping. Venting to release the emotions you are feeling and dumping them onto someone else are two very different things. Choose wisely. Appreciate how far you have come. Write down a list for what you want to achieve, and how you can get there. Talk to people in your field. Connect with others, do it yourself instead of waiting on someone to do it with you. Take initiative. When you are feeling self doubt remind yourself that its okay, but it is not who you are. You are dope as hell and on this earth for a reason. Don’t give up. None of us are inadequate. We all matter and have gifts to offer to the world. Someone really needs to read your book, watch your film, and view your art. No matter how bad things may seem, you are loved, and deserving of love. Comparing your journey to someone else’s is an exercise infertility. Know that what is meant for you cannot be taken by someone else. Be inspired by others, not jealous. You may not have reached certain milestones or achievements yet, but that does not mean they are not attainable. The only way to receive them is to not give up on yourself. 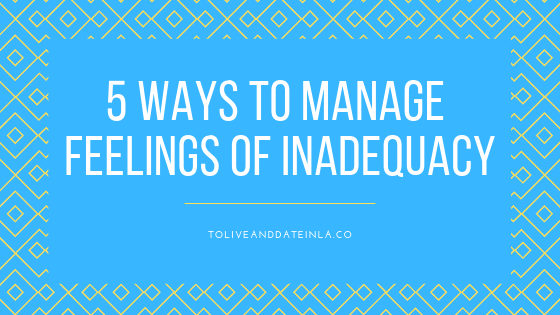 How do you deal with feelings of inadequacy? Sound off in the comment section below.